I was going to make quesadillas for this week’s meatless recipe, but after eating Boeuf Bourguignon for dinner Friday night and Provencal Roast Chicken (yes, you get a recipe for that this week!) on Saturday, that for Sunday, I absolutely did not want anything fried. Sure, sure, you -could- make quesadillas by baking them, but they don’t taste as good that way! And yes, refrieds are made by lightly frying mashed beans in olive oil–but I use much less oil in frying beans than I do when frying quesadillas. 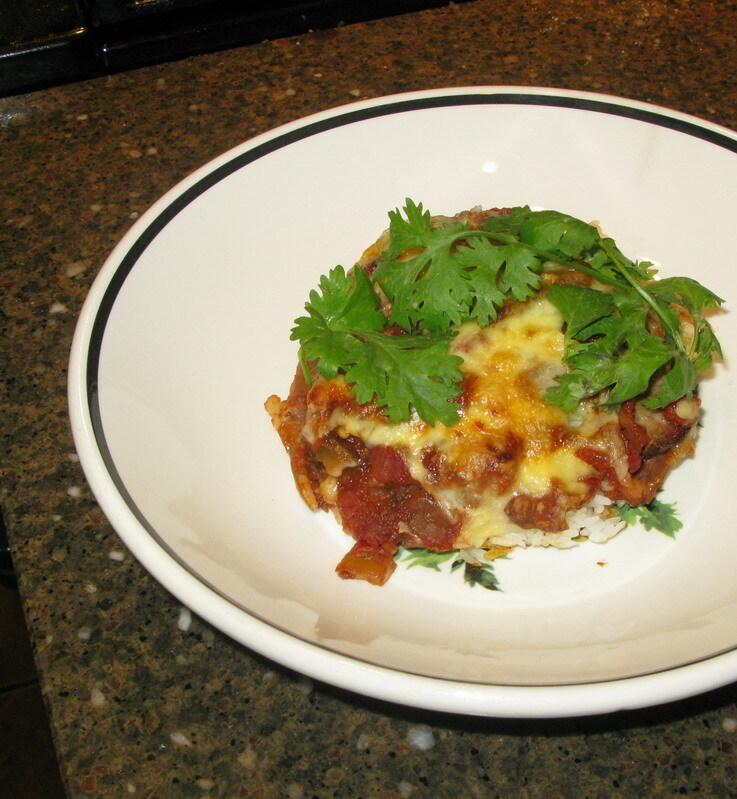 So, I had the inspiration of making a vegetarian version of arroz gratinado, the delicious Mexican casserole of rice, salsa and shredded meat covered with melty-gooey-cheesy goodness. 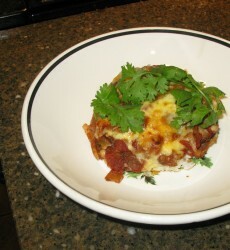 My version includes refried beans anyway–so I decided, what if I left out the meat? And what if I added sauteed kale and chard? That sounded ever so delightfully tasty to me. Look, you don’t need a recipe to make this–just do something like what I did. Then I shredded some sharp cheddar cheese and started layering. First a spray of some olive oil to keep the goodies from sticking. A smear of about three tablespoons of salsa, (you can use homemade or from a jar–I like Frog Ranch Chipotle if I don’t have homemade on hand) to cover the bottom of the pan, and then a layer of rice that gets packed down a bit. Then beans, a tiny bit of salsa, then greens,a little more salsa and finally, the cheese. And then, into the 375 degree F. oven it goes for about twenty minutes, or until the cheese is melted, bubbly and browned in a couple of spots, and out it comes. Cilantro gets sprinkled over it and away we go! I served it with freshly made Calico Salsa and some blue corn tortilla chips on the side. Some other vegetables you could layer into this casserole would be roasted corn on the cob (cut off the cob, of course! ), sauteed summer squashes seasoned with caramelized onions and garlic, roasted tomatoes and red bell peppers, roasted poblano chiles, or sauteed mushrooms. That looks and sounds delicious. I have a question about dried pomegranate seeds, which I have seen mentioned in your recipes. Thanks to a new, nearby store I now have a constant supply thereof (and many other yummy things). Can you tell me the main uses for them and how to best use them in cooking? Where I’m from, we eat fresh pomegranates as a fruit but don’t dry the seeds for later use in cooking, so I’d love to learn a bit more. Thanks. Yum! I do this without the rice for my generally rice hating boyfriend (I know, I know, who hates rice!) and instead layer corn or wheat tortillas depending on what I have. I am not sure what you mean by frying quesadillas. We’ve always made ours by warming a corn or flour tortilla on a comal or cast iron griddle. If they are well seasoned you don’t need much, if any, oil. Sprinkle the toppings you want over the tortilla then either top with a second warmed tortilla or fold the first over the filling. Let cook a little longer, flip and let that side cook a little longer as well. I also make “faux” refried beans by mashing or slightly puréeing well flavored pintos. No added fat. Though I will sometimes add some of the brine from pickled jalapeños to the beans.